Data from Markit on exchange traded funds reveal investor appetite moving with divergent outlooks for central bank policy. 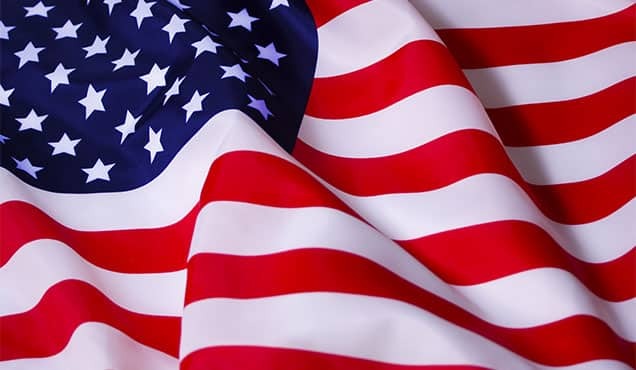 The sharpest outflows of funds exposed to US equities for six years suggest investors are worried about the impact of tighter policy at the Fed and the impact of a stronger US dollar on corporate earnings. 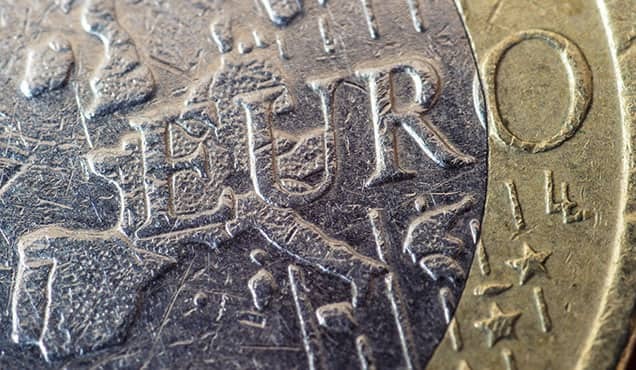 Looser policy outlooks at the ECB and the Bank of Japan have meanwhile encouraged investors to move into these markets seeking gains associated with central bank stimulus and weakened exchange rates, the latter likely to boost exports and earnings. 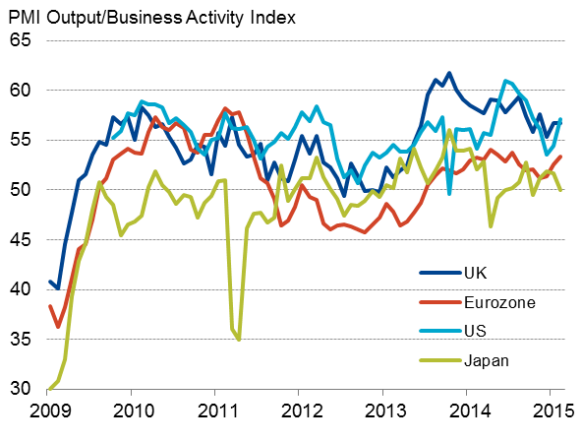 A key theme of global economic trends so far this year has been the continued out-performance of the US and UK compared to other major economies. The latest PMI business survey data from Markit point to the US and UK economies both growing 0.6% in the first quarter. While low inflation, due to the oil price fall, means policymakers will be in no hurry to hike interest rates, the sustained expansions increase the likelihood of the Fed and Bank of England starting to tighten policy later this year. 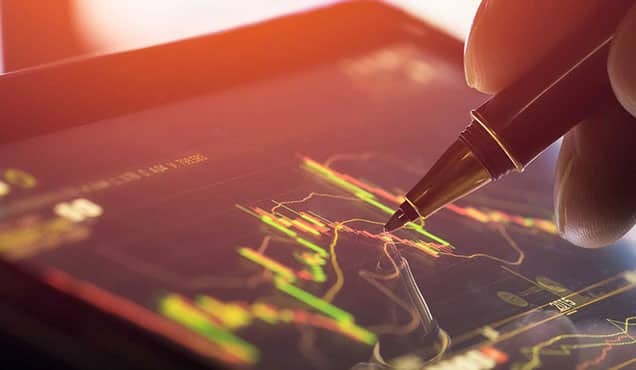 Although equity benchmarks have pushed higher in recent weeks, there are signs that investors have become less enthusiastic about gaining exposure to the US stock market, most likely reflecting the prospect of tighter policy and the detrimental impact the stronger currency will have on corporate earnings. The US dollar has appreciated in reaction to the policy outlook, with the dollar index up to its highest since 2003. 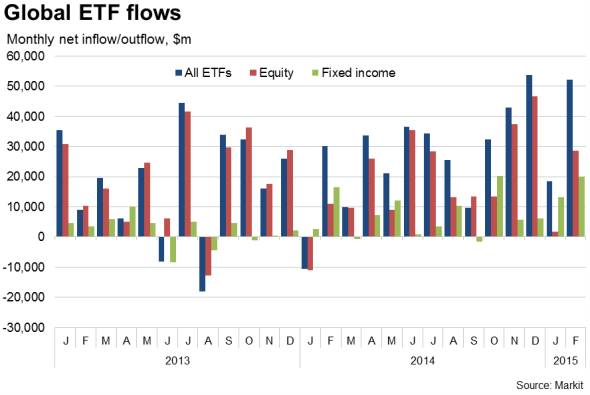 In the first two months of 2015, worldwide exchange traded funds saw a net inflow of $70.5bn, but just $6.6bn of this went into US-exposed funds. 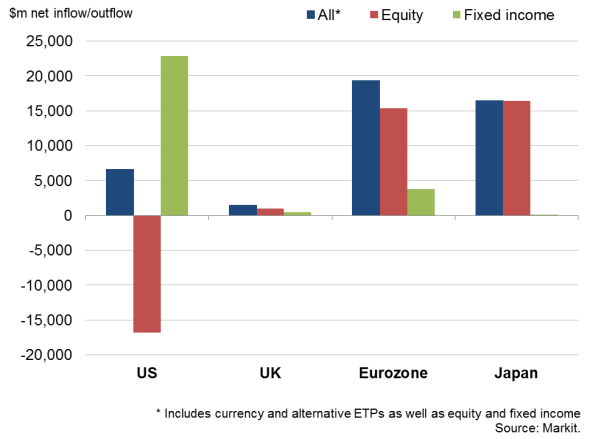 Even more striking is the $16.8bn outpouring from US-exposed equity funds so far this year, which puts these funds on course for their largest quarterly decline since the first quarter of 2009. 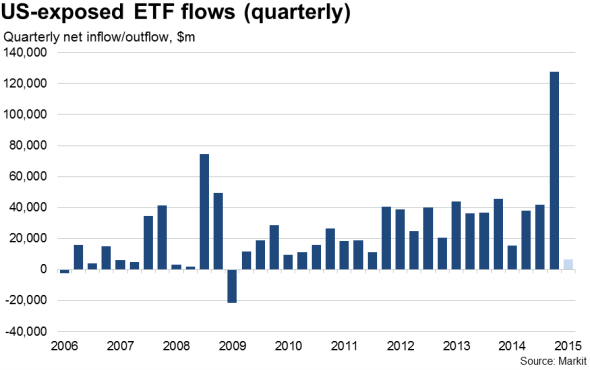 However, these US equity fund outflows need to be looked at in the context of a record $103bn inflow in the fourth quarter of last year. 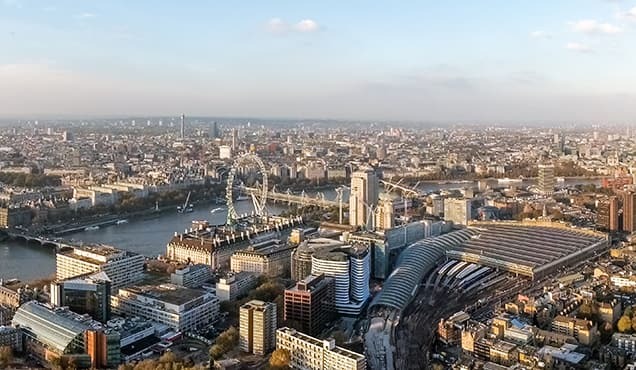 Investors seem less concerned about the UK, where a record $1.4bn monthly inflow into UK-exposed funds in January was followed by a $78m inflow in February. 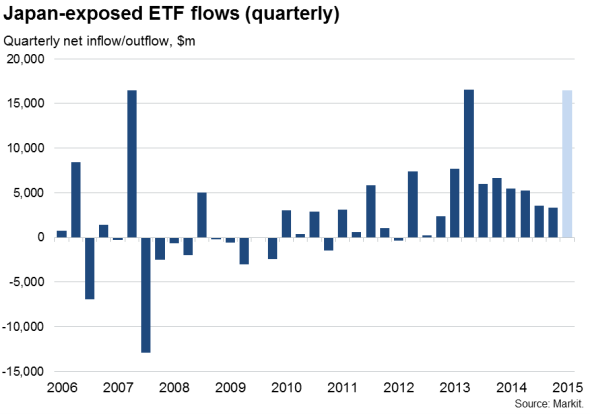 UK-exposed funds are consequently on for their highest net quarterly inflow since the third quarter of 2013, with investors boosting their exposure to fixed income and equity funds alike. 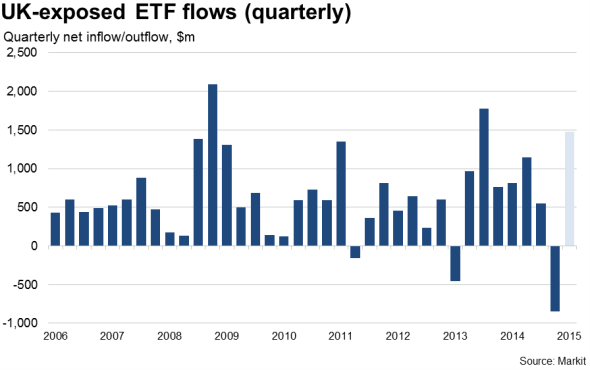 The inflows into the UK are dwarfed, however, by investment flows into eurozone and Japanese exposed ETFs, which have seen net inflows of $19.3bn and $16.5bn so far this year, the former putting the region on a for a record net quarterly inflow. 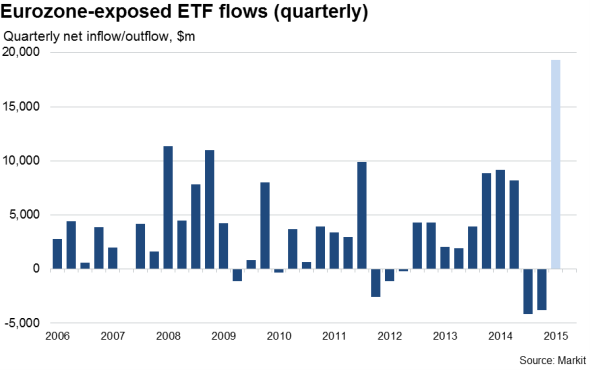 Inflows into euro area exposed funds are most likely being driven by investors eagerly anticipating the commencement of quantitative easing by the ECB. 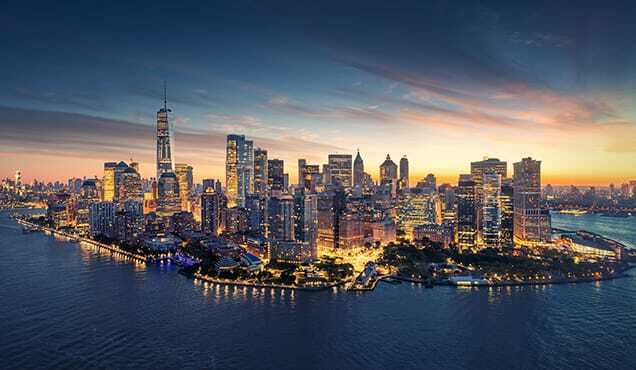 Not only is QE expected to drive up asset prices as the central bank sweeps up €60bn of assets each month, but the expansion of the money supply is also expected to boost the economy, as well as corporate earnings, by driving down the euro, which has already dropped to an 11-year low against the US dollar. Investors' expectations seem well placed: a key development in February was the renewed sign of life in the euro area, where the PMIs hit a seven-month high as all four-largest euro countries expanded in union. The data suggest that business activity has already been lifted merely through the announcement of QE by the ECB back in January and the associated fall in the euro. Sentiment has also improved towards Japan, with the first quarter set to see the biggest net inflow into funds exposed to the country since the second quarter of 2013. 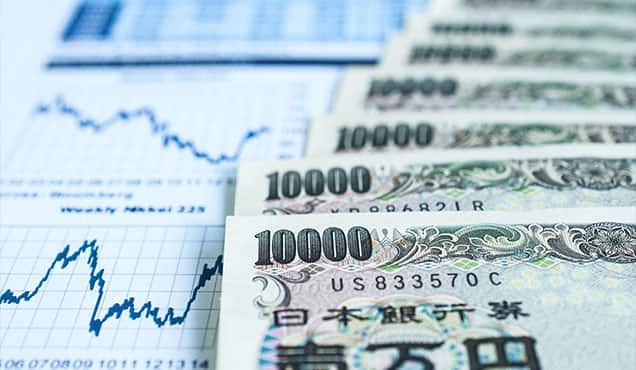 Investors have been reassured by the economy pulling out of its recession, but are also conscious that the Bank of Japan is likely to have to do more to defeat inflation and revive the economy. Such a need for additional stimulus was highlighted by the PMI signalling a return to stagnation in February alongside a weakening of price pressures.